Marquees and technical structures assembled for fairs, exhibitions, parties and events, are becoming more and more prevalent, employed for organized events in every season of the year and not limited only to the summer and warmer periods. Marquees and technical structures can be assembled in very little time, and therefore are a great solution for all occasional events. In order to ensure a really efficient and successful event, the inside temperature of the marquee must obviously be optimal and this means that internal heating is essential for the success of the event. Professional heating products of Biemmedue are widely used in the entertainment industry and for events. Arcotherm range of warm air generators are ideal not only to heat marquees and technical structures, but also during the preparation phase of the event. 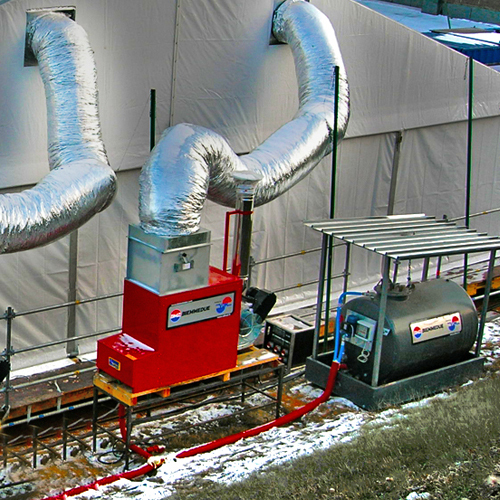 Thanks to their maneuverability, great mobility, sturdiness, reliability, flexibility and speed of installation, Biemmedue’s heating products are the ideal and more practical solution for temporary installations, because the installation of other heating systems would be impossible or would require more time and higher costs. The Arcotherm range of BM2 warm air generators comprises innovative machines, ready for use, installed quickly by professionals, offering very high heat and space efficiency. 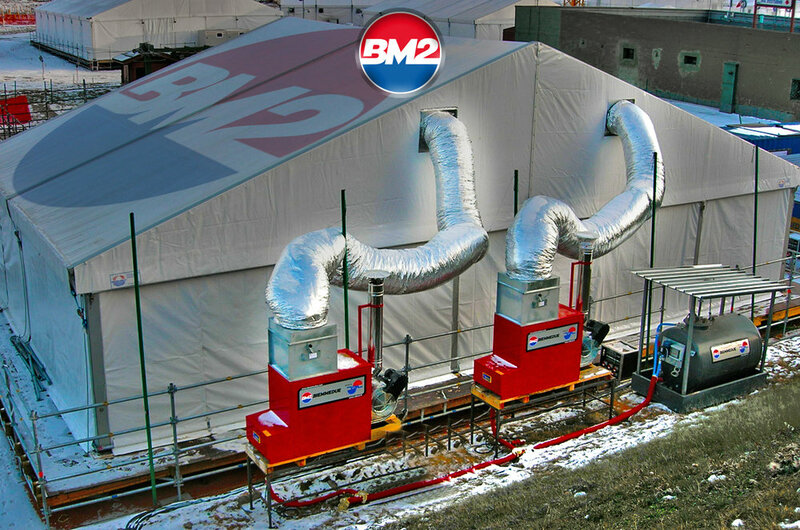 For the heating of event marquees and technical structures, Biemmedue offers warm air generators adapted for every need. For each space requirement, Biemmedue offers the most appropriate generator, choosing among a vast range of machines, according to the rationale of mobile or temporary heating. Through an examination of the structure of the marquee, one can decide between direct and indirect combustion generators. What is the difference between the two? Direct combustion generators do not need flues to take out the exhaust combustion fumes, and therefore can used in spaces which have autonomous air exchange. Indirect combustion generators on the other hand, need flues but can be perfectly employed in closed spaces, without ventilation. For the heating of marquees and technical structures, the correct choice of warm air generators ensures optimal results, providing a healthy and pleasant environment and the achievement of the perfect, desired temperature. Biemmedue company, with head office in Cherasco, in the Province of Cuneo, world-leader in the field of professional heating, offers ready-to-use solutions, for marquees, technical structures, gazebos and pavilions for events. Each BM2 product is constructed according to the most astringent international standards of quality and safety and ensures, for the user, efficiency and ease of use, at an affordable cost and optimum yield. High thermal yield and low operating cost, make event heating apparatus produced by Biemmedue, simple, rapid and ideal for the heating of marquees and technical structures of any size, at any time of the year.